We get this question a lot, we understand and appreciate that you don’t move everyday and moving industry’s jargon is not something that you need to be familiar with. So, for your convenience we have decided to present a typical 3.5 Ton Longwheelbase Luton van, which is most likely the size of vehicle that will turn up for your removal , unless specifically it’s a bigger or smaller vehicle you have booked. 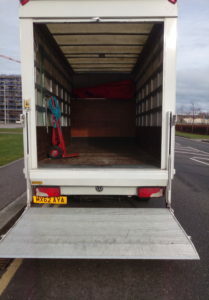 Please note, that a Luton van can come in short, medium and long wheel-base, which determines the length of the vehicle and the loading space. 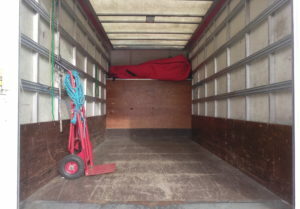 All our vans are long-wheel-base, and come with at least 14ft (just over 4m) long loading space. 1. An unfurnished 1 bedroom flat, including white goods and a wardrobe with roughly 20 boxes –for hoarders this van size still may not be enough. The above is not a promise but a general guideline. 2. Or a semi-furnished 2 bedroom flat – not including wardrobes and white goods – with between 20-30 medium size boxes. Again, not all 2 bedrooms would fit in a Luton van, all the more reason to de-clutter more. Also if you have a house with garage or a loft, expect more contents from there. 3. Or a fully furnished 3-4 bedroom property: If your property is fully furnished, that means, you literally only have your personal belongings, in which instance, a Luton van may still most likely be enough, as it can take between 80 – 100 medium size boxes, if no furniture is involved and everything is boxed up. If you think that your contents may not fit in this size of van, we could recommend either going for a 7.5 Ton truck or higher, or we can also provide multiple 3.5T van, whichever would work out more convenient and economical for your move. For local moves, for instance a removal in Edinburgh, it may not be a big issue if you slightly under-estimate the size of the vehicle required, because we can always come back for the remaining contents, or try to send another vehicle – this would normally affect the cost though. 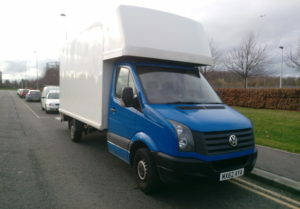 However, for long distance moves, like London to Inverness or London to Aberdeen, it is very important that we estimate the correct size of the vehicle required, because last minute addition of a vehicle can easily at least double the cost, if not more – and sometimes, availability at such short notice can become an issue. So it is important to determine the correct amount of contents and the right size of the vehicle required to move those contents. Additional Information: Most people refer to vans as Transits or Sprinters, which are models of vans; Ford makes Transits, and Mercedes makes Sprinters, nonetheless, they are not necessarily always in a Luton form i.e. with a box like loading space at the back. They can come in all forms like recovery vehicles, cherry pickers, or panel vans but the most commonly used type for removals is the Luton van, sometimes also referred to as Box van.